My pal Kelly, who is contributing Rhinoceros for the Reaktion Books "Animal Series" (here) was recently in Australia, where she saw a statue of a wild boar on Macquarie Street outside the Sydney Hospital. 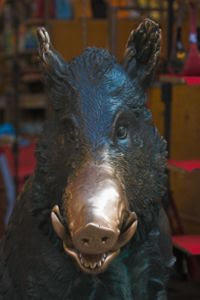 According to the sign attached to the sculpture of "Il Porcellino," if one drops a coin in the box (to benefit the sick in the hospital) "legend says that if you rub the nose of the boar you will be endowed with good fortune." Kelly suggested that this probably wasn't a custom original to the Aussies, and she was correct. The statue in Sydney of this wild boar is a copy of the Italian original that can be found in the Uffizi Galleries in Florence. According to the Sydney Hospital web site (here), the copy was presented to the hospital in 1968 by the Marchessa Clarissa Torrigiani in memory of her father and brother who had both been renowned surgeons at the hospital. The photo to the right is of the "Il Cinghiale" ("Il Porcellino," or "piglet," is the statue's nickname) fountain in the Mercato Nuovo in Florence. Apparently, the wild boar was first sculpted and cast by Pietro Tacca in 1612, based on a marble Italian copy of a Hellenistic marble original that has been lost or destroyed. There are five copies of "Il Porcellino" made in 1962 in different locations, including one at the Derby Arboretum in England that replaced one destroyed by bombing during World War 2. According to the Public Art Around the World site (here), the other modern copies are in California, Florence (presumably the one above the the public can touch), and Canada (one in Waterloo and one in Victoria). There is another Il Porcellino replica in Sutton Place Park in Manhattan (East 57th St at the East River, a lovely little spot). Found your blog while trying to find out more about the boar, which my son and I discussed this morning!